It is also the time which speaks through him when devastating self-portraits show the artist smiling towards the spectator, the teeth brushed with wonderbright, the body probably a little more muscular than of reason. 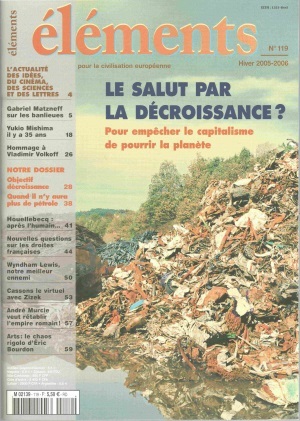 Megalomania or criticism of vanity ? A little both, all things considered. Derision excludes paradoxically here any calling into question what one laughs at, in a style which defines only too well the young contemporary art : as with the scenario writer Quentin Tarantino, who only caricatures the seventies to like them, and apes their violence without judging it (neither in good, nor in evil). The pastiche, to borrow the formula of the American culturalist Frederic Jameson, replaces the parody. Chaos overrides sense. To this symptomal topicality of the work responds on the contrary a certain formal nostalgia. Not towards the canons of the great classical art, which seem definitely irretrievable by the ways of thinking of today, but towards these exuberant experiments of the art of the beginning of the twentieth century - cubism and surrealism at the head. Here is still a feature of our time : the retrospective and the mixture become principles, and the criterions of the taste are definitively vague. The canvas of our painter are now sold in several galleries of the capital and province, but also in Boston : a start of success thus takes shape for him. Some will regret it. Some others will say to themselves that besides being instructive and valuable as symptoms, these canvas have the infinite merit to recall that, in spite of our lifesickness, we can still find some fervour in the way we look at things. 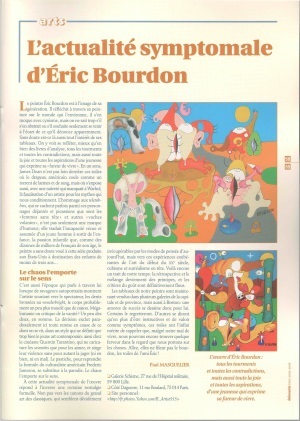 Well, they don't give the blues [the 'bourdon'], the canvas of the friend Eric !